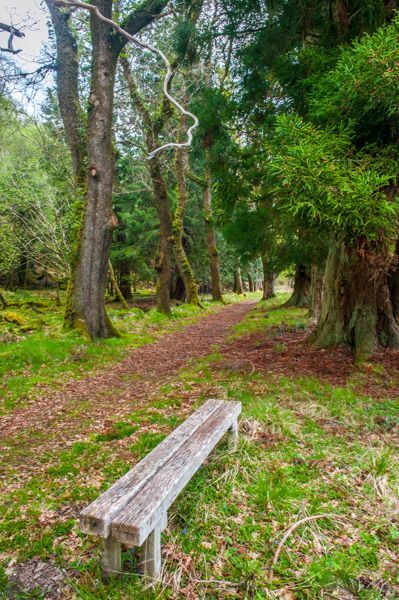 A circular walk following an avenue of trees planted to commemorate the week that Bonnie Prince Charlie stayed at Kinlochmoidart House when he launched the 1745 Jacobite Rebellion. The walk passes through beautiful woodland and beside a secluded 19th-century church. When Bonnie Prince Charlie launched his 1745 attempt to wrest the British throne from George II, he landed at Loch nan Uamh (see our Road to the Isles article for more) and was met by a core group of Jacobite supporters. The clan chiefs needed time to gather their men and spread the word about the rebellion, so they proposed to meet again at Glenfinnan and raise the Prince's standard. While the Prince waited to see if the clans would answer his call, he crossed to Glenuig, in Moidart, and was met there by the locals, who danced a reel in delight at his arrival. Prince Charlie went on to Kinlochmoidart House, where he stayed for a week. Donald MacDonald of Kinlochmoidart helped the Prince prepare letters asking for support. MacDonald was aided in advising the Prince by John Murray of Broughton, who later said that the Prince asked MacDonald to deliver the letters and the lord of Kinlochmoidart refused unless he was named as the Prince's aide-de-camp. Prince Charlie had no choice but to agree. This story must be taken with a grain of salt as it seems Murray had a distrust of Highlanders and may have put the tale about for his own interests. Whatever the truth of the story, Prince Charlie stayed at Kinlochmoidart House until the 18 August, when he left for Glenfinnan and the raising of the royal standard. As for Donald MacDonald of Linlochmoidart, he was captured while delivering messages on the Prince's behalf, imprisoned in Carlisle, and executed on 18 October 1746. After the Battle of Culloden, the Duke of Cumberland had Kinlochmoidart House burned to the ground. Just up the road a row of 7 beech trees was planted to represent the Seven Men of Moidart who landed with the Prince in 1745. The originals are gone now, but a new row of 7 trees has been planted. In 1882 a new Kinlochmoidart House was built in Scottish Baronial style by a brewer named Robert Stewart. 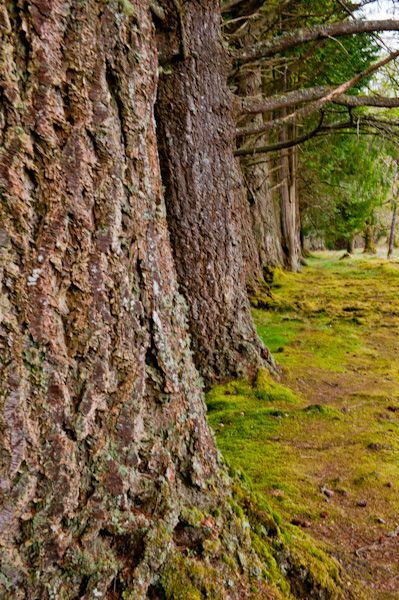 Beside the house, a long avenue of trees was planted to commemorate the connection of Kinlochmoidart with Bonnie Prince Charlie. The avenue is known as Prince Charlie's Walk and forms part of a circular walk taking in views if the 19th-century house, St Finan's Church, and a very old stone bridge. The walk is about 1 3/4 miles long and should take no more than 1 hour. Park just off the A861 at the church. The walk starts at St Finan's Church, built in 1858 by the then owner of the Moidart Estate, Robertson MacDonald, on a shelf of land offering views over Loch Moidart. 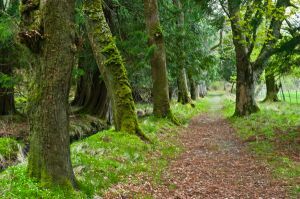 The trail then joins the avenue of trees planted in the Prince's honour before crossing in front of Kinlochmoidart House. Just as it seems you are going to drop in on the house owners unexpectedly the trail turns left of the house and wends its way uphill to a small crag. There are marker arrows guiding you through very pleasant woodland, over a small stream, near the remains of a walled garden, and across a wooden footbridge. 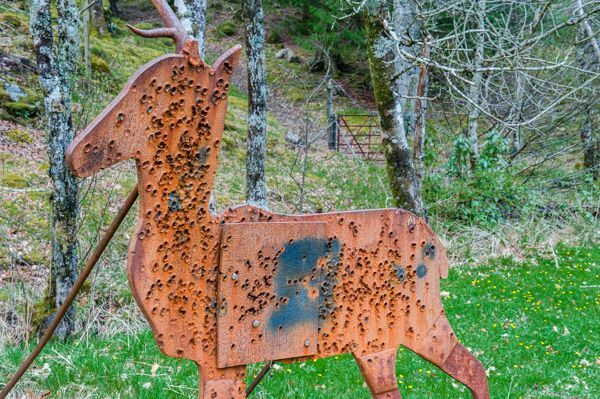 Look for the peculiar metal deer silhouettes, used for target practice! Follow signs marked 'woodland walk' to another set of signs marked 'MacKenzie Walk'. There are excellent views of Glen Moidart along the trail, and beautiful old pine trees for shelter. Just before the trail loops back to the main road you cross a very old stone bridge. It takes almost as long to write the directions as it does to take the walk; it is essentially just a circular loop around Kinlochmoidart House, following the memorial avenue of trees above the house and looping back to the parking area by the 19th-century church. What is appealing about the Prince's Walk is both the beautiful Highland surroundings, with wonderful colours in the Autumn, and the sense of following in the footsteps of history. Though Prince Charlie did not tread the 'Prince's Walk', he would have seen the same scenery and perhaps marvelled at the beauty of the Highlands as a modern visitor certainly will. 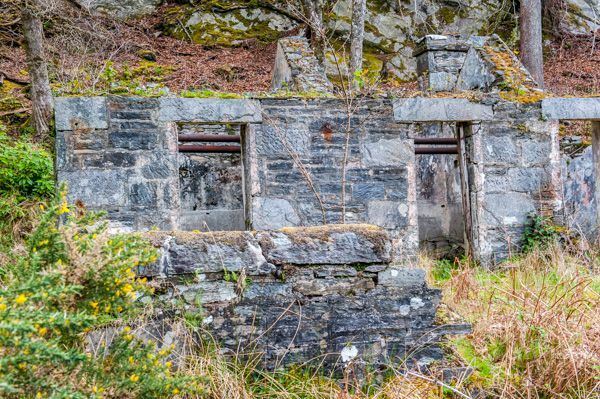 Location: Off the A861 1 mile east of the Seven Men of Moidart layby. Park as for St Finan's Church. Nearby accommodation is calculated 'as the crow flies' from Prince's Walk, Kinlochmoidart. 'Nearest' may involve a long drive up and down glens or, if you are near the coast, may include a ferry ride! Please check the property map to make sure the location is right for you.